Economical and lightweight. Ideal for short-term therapy. Normal treatment time averages 7-9 minutes. Reusable intake filter. Contoured handle holds variety of nebulizers. 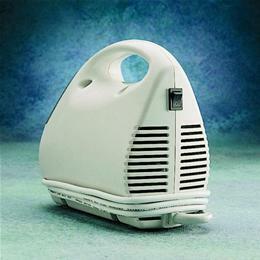 Convenient cord storage separate from nebulizer supplies. UL-listed. Includes disposable SideStreamâ„¢ nebulizer. 5-year warranty.